Inday is a quick-serve modern Indian-inspired restaurant in New York City. The menu is full of imaginative, colourful, healthy, and fresh dishes. The recipe today is my version of their Curry Flower, which is cauliflower rice with a turmeric lemongrass curry. I love when a restaurant inspires me to get into my kitchen and cook. Inday did just that. 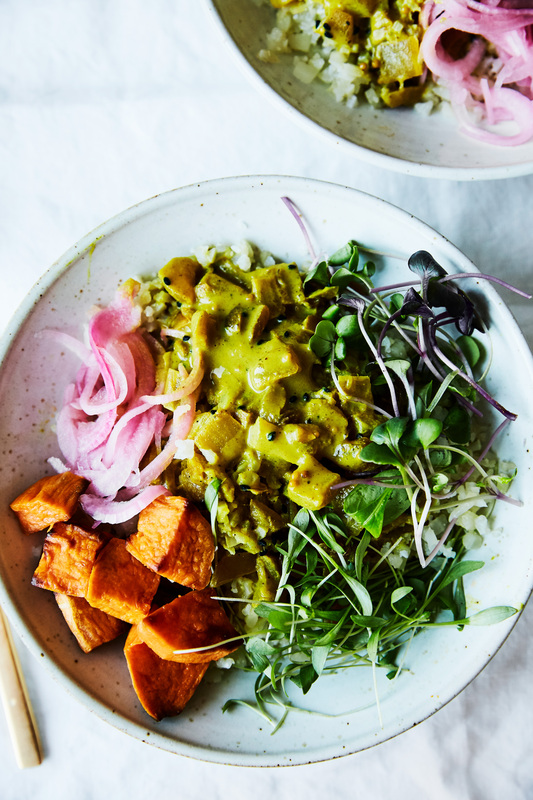 This recipe is actually 4 simple recipes in 1: golden curry sauce, roasted sweet potatoes, pink pickled onions, and cauliflower rice. Together they make a vibrant and hearty meal that tastes fantastic. I encourage creativity with most of my recipes. Feel free to introduce different vegetables or replace cauliflower rice with grains. Also, the sauce is extremely versatile and can liven up any dish. Since I retested and tweaked the recipe many times, I’ve had extra sauce to relish. I just enjoyed the sauce on millet with sautéed spinach and avocado. It was delicious! I tried to make the curry sauce recipe as simple as possible. Instead of having to mince the lemongrass, ginger, and garlic, you use a high-speed blender. It saves loads of time. Also, I usually buy for pre-chopped onion. First off all, it’s a simple luxury I love to indulge in. Secondly, I’ve been putting off getting my knives sharpened and I don’t want to cut myself (the honest lazy truth). If you decide to buy pre-chopped, than measure out a cup of onion for this recipe. This is another recipe shot by Suech and Beck! You can check out more of their amazing work here. 2 sweet potatoes, peeled and chopped about 1"
In a small non-reactive bowl, cover red onions with rice vinegar. Allow to sit at room temperature for at least 1 hour. Store in fridge for up to two weeks. Drain before using. Preheat oven to 450°F. Line a baking sheet with parchment paper. Toss sweet potatoes with olive oil and salt on prepared baking tray. Bake for 30-35 minutes, or until softened and charred. Place coconut milk, lemongrass, ginger, and garlic in a high-speed blender and blend until smooth. Set aside. In a skillet, heat oil over medium-high heat. Add the onions and cook until beginning to golden, about 5 minutes. Add the spices and toast for an additional minute. Pour in the coconut milk mixture and simmer for 5 minutes, stirring frequently, until sauce has thickened slightly. Season with salt and pepper. Sauce is ready to serve. In a large skillet heat oil over medium-high heat. Add the cauliflower and stir fry until softened and slightly golden. Remove from heat and season with salt. Divide cauliflower rice and sweet potatoes between three bowls. Pour sauce over each bowl and garnish with pink pickled onions, raisins, cilantro/and or micro-greens. Serve hot. *Riced Cauliflower - Cut a large head of cauliflower into florets. In a few batches, pulse the florets in a food processor until it mixture resembles rice. This entry was posted in Main Dishes and tagged cauliflower rice, curry, ginger, gluten-free, healthy, indian, lemongrass, muchi curry, plant-based, plantfood, whole foods. Bookmark the permalink.